Symbols*: As the biggest mammals on earth, whales move with timeless perfection. They exude wisdom and are connected with the great mysteries of the ancients. The three whales have penetrated the three levels of consciousness with their radiating movements. The cups echo the circular motif and align themselves with the rotation of the whales. One whale breaks the surface of the water or consciousness, thus absorbing the lunar energy that illuminates the sky. Another whale plunges into the blue-green waters to gather more secrets from the deep as a means of initiating creative thought. Star energy is reflected back into the ocean depths and enhances the feeling that everything is connected in the universe. Description*: A sense of wholeness encompasses your being. You are experiencing the awesome powers of your place in life. You are one with the universe and are ready to embrace all the love and happiness that you feel welling up within the depths of your being. Shower the people in your life with all the love that you can give. Let the exultation of achieving your dreams envelop the people around you with good, happy energy. Constellation: 10 - The Wheel, the I Magician, XIX Sun, Aces, and Tens. 1 – Communication; Self consciousness; Individualization; Self-expression; Initiative; At-one-ment; Originality. Possible Meaning: You have now come a full circle in your life. You have achieved the goals and dreams you have set for this time. The reigning of happiness and contentment. You’re feeling whole and complete. Renewed familial ties, friendships, and relationships in general. 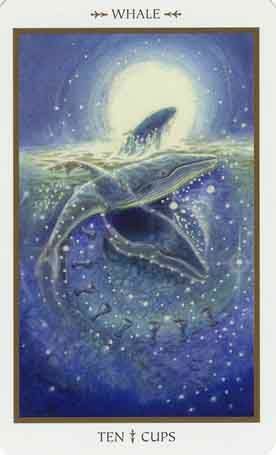 The whale asks you to go deep within yourself to awaken your inner creativity, he is the inspiration you may need to be creative. Thoughts/Points to Ponder: This is a very joyful place to be right now. The circle represents a full circle in life, the moonlight is the end of the day – the end of the cycle. I can see the whale moving, circling around, swimming and loving every moment of it. She is smiling, she is just happy. I feel loved, and happy myself. A Whale totem teaches you to go deep within yourself to awaken your inner creativity. But they also teach us not to become lost in our creative imagination, but to live in the real world. When a Whale totem shows up in your life, examine your own use of creativity. Apply your own creative intuition to formulas -- this is what imbues them with power and magic. Creativity for the sake of creativity is not what the Whale teaches. It awakens great depth of creative inspiration, but you must add your own color and light to your outer life to make it wonderful. The sound of the Whale teaches us how to create with song.